Continuing my series of articles on aspects of the theology of marriage, I would like to examine a beautiful patristic comparison that is relatively little known today, but was much in the mind of the scholastics and frequently comes up in the work of the Angelic Doctor—namely, the comparison of the hypostatic union with a nuptial union. Marriage before fleshly embrace signifies the conjoining of Christ to the soul by grace, which [union of grace] is indeed dissolved by a contrary spiritual disposition, namely sin. But by the fleshly embrace marriage signifies Christ’s conjoining [of himself] with the Church, as to the assumption of human nature in the unity of his person, which [union] is altogether indivisible. The fourth thing set out is that they “went out to meet the bridegroom and the bride.” Who is the bridegroom, and who is the bride? It is explained in two ways, following two marriages. One, the marriage of divinity to flesh, which was celebrated in the womb of a virgin: “For he as a bridegroom coming forth from his bridal chamber” (Ps. 18:6). The bridegroom is the Son himself, the bride human nature; hence to go out to meet the bridegroom and the bride is nothing other than to serve Christ. Likewise, there is the marriage of Christ and the Church: “He who has the bride is the bridegroom” (Jn. 3:29). Therefore those who prepare the lamps intend to please the bridegroom, i.e., Christ, and the bride, i.e., Mother Church. Nevertheless, St. Thomas is not entirely comfortable with the comparison of the union of natures to a marriage, because marriage requires two persons who consent to each other; a nature, as such, is not the source of consent. Envisioning the human nature and the divine nature as centers of action or volition begins to sound fishily Nestorian. Consider his response to the rather obscure question: Whether it is fitting that Christ should receive a dowry? There are two opinions on this point. For some say that there is a threefold union in Christ. One is the union of concord, whereby He is united to God in the bond of love; another is the union of condescension, whereby the human nature is united to the Divine; the third is the union whereby Christ is united to the Church. They say, then, that as regards the first two unions it is fitting for Christ to have the dowries under the notion of dowries, but as regards the third, it is fitting for Him to have the dowries in the most excellent degree, considered as to that in which they consist, but not considered under the notion of dowries; because in this union Christ is the bridegroom and the Church the bride, and a dowry is given to the bride as regards property and control, although it is given to the bridegroom as to use. But this does not seem congruous. For in the union of Christ with the Father by the concord of love, even if we consider Him as God, there is not said to be a marriage, since it implies no subjection such as is required in the bride towards the bridegroom. Nor again in the union of the human nature with the Divine, whether we consider the personal union or that which regards the conformity of will, can there be a dowry, properly speaking, for three reasons. First, because in a marriage where a dowry is given there should be likeness of nature between bridegroom and bride, and this is lacking in the union of the human nature with the Divine; secondly, because there is required a distinction of persons, and the human nature is not personally distinct from the Word; thirdly, because a dowry is given when the bride is first taken to the dwelling of the bridegroom and thus would seem to belong to the bride, who from being not united becomes united; whereas the human nature, which was assumed into the unity of Person by the Word, never was otherwise than perfectly united. Wherefore in the opinion of others we should say that the notion of dowry is either altogether unbecoming to Christ, or not so properly as to the saints; but that the things which we call dowries befit Him in the highest degree. Human nature is not properly said to be a bride in its union with the Word, since the distinction of persons, which is requisite between bridegroom and bride, is not observed therein. That human nature is sometimes described as being espoused in reference to its union with the Word is because it has a certain act of the bride, in that it is united to the Bridegroom inseparably, and in this union is subject to the Word and ruled by the Word, as the bride by the bridegroom. In Christ’s conception a certain marriage was sealed through the indivisible conjoining of the divine and human nature[s]. But requisite for a marriage is consent, which is both requested and brought back through the words of messengers. 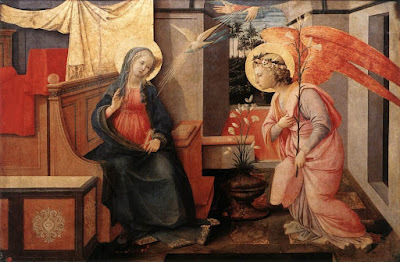 Therefore it was proper that God, through his angel, should seek out the consent of the Virgin, from whom he would assume human nature. Fourth, that there would be shown to be a certain spiritual marriage between the Son of God and human nature. And so by the Annunciation the Virgin’s consent was besought in lieu of [=on behalf of] the whole of human nature. In IV Sent. d. 27, q. 1, a. 3, qa. 2, ad 1. Super Matt. 25, lec. 1, n. 2014. Super Ioan. 2, lec. 1, n. 338. According to the scholastic definition, the dowry of the blessed is “the everlasting adornment of soul and body adequate to life, lasting for ever in eternal bliss.” There are three dowries of the soul: vision, love, and fruition; and four of the body: impassibility, agility, subtlety, and clarity. In IV Sent. d. 49, q. 4, a. 3. Cf. Super Ps. 18, n. 3. In III Sent. d. 3, q. 3, a. 1, qa. 1, sc 2. Summa theol. III, q. 30, a. 1.